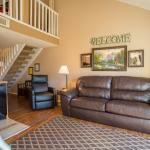 Located 3.4 km from Titanic Museum in Branson this air-conditioned apartment features a patio. The unit is 3.5 km from Mickey Gilley Theatre. The unit equipped with a kitchen with a dishwasher and oven. A TV with satellite channels and DVD player is provided. Other facilities at Tuscany on Taneycomo Condo include a fitness centre. Andy Williams Moon River Theater is 3.9 km from Tuscany on Taneycomo Condo while Ride the Ducks Branson is 3.9 km away. Springfield-Branson Airport is 71 km from the property.